Pharmacy and Chemist shops are last part of distribution channel and are in direct contact with customers i.e. patient and/or his caretaker. Pharmacy and Chemist shops are a profitable as well as a charitable business. In this article we will provide you almost complete information about how you can start pharmacy and retail business. For staring a pharmacy or chemist shop business, a person requires Retail Drug License Number which is issued by Drug Control Department and has to employ services of a registered pharmacist. Along with prescription drugs, pharmacy and chemist shops also deal in food and dietary supplements, Ayurvedic Preparations, Cosmetic products and OTC products. Online Pharmacy concept are also becoming popular in pharmaceutical sector. Pharmacy can be defined as a store or shop or place where drugs and medicines are dispensed, compounded, prepared under supervision of a registered Pharmacist against prescription of a Registered Medical Practitioner. Most of us feel confusion when it comes to differentiate between Pharmacy and Chemist Shop. Both are similar in many aspects. But still have lot of difference in regards with operation and functioning. Both require presence and supervision of Pharmacist during working hours. Pharmacy is a premises where compounding, preparation of drugs and medicines as per patient requirement is conducted along with dispensing of pre packed drugs and medicines dosage form where as chemist shop is a premises where only dispensing of pre packed drugs and medicines dosage form is conducted. Read Related Article: How to start wholesale Distribution Business in Pharmaceutical Sector? Minimum of area required for starting Chemist Shop and Pharmacy is 100 square feet. Premises should have adequate space for refrigerator, racks, pallets, sitting etc. Walls and floor should be at least cemented and concreted roof. No crack and flake should be present in premises. For handling daily activity in pharmacy and chemist shop, supervision of Pharmacist is must. No activities can be carried out in retail pharmacy and chemist shop without presence and supervision of a Registered Pharmacist. A Registered Pharmacist is a person who holds a diploma, degree or doctorate in Pharmacy and his/her name is entered in the register of the state pharmacy council in which he/she is for the time being residing or carrying on his profession or business of pharmacy. Ownership proof or in case rented premises, rent agreement with owner detail. Search for Premises with required space at Prime Location. Submit application for retail license for sale, purchase and exhibition of medicines manually and/or online. If Drug Authority is satisfied with all formalities. Application will be approved and drug authority will issue letter for grant of drug retail. Drug authority will issue drug license number after being satisfy with documents and premises. With this drug license number, sale and purchase of medicines and drugs and related products & services can be carried out at retail basis. Total initial investment will vary according to location, area, city etc. There is requirement of shop or premises to start Pharmacy outlet or chemist shop. This shop or premises could be owned or rented. In owned shop, we can add purchase cost in investment if pharmacy is to start after purchasing shop. But starting by purchasing own premises or shop is not possible for majority of start-ups. For them renting a premises or shop is best option. Rent and/or cost of premises can change with change of location. So add what is your own shop or premises rent. Suppose rent is 6000/- per month. Pharmacist salary also varies place to place. We are supposing it 12000/- for fresher candidate. Now come to accessories investment. Decoration and interior expenses vary according to your need. Simple interior will cost less and high profile interior will cost high. Furniture, fitting and chair etc will cost approximate 30000/-. Refrigerator cost is approximate 9000/-. License fee and documentation may be cost approximately 6000/-. Few other hidden expenses may cost approximately 15000/-. Above expenses are without purchasing any single medicines. These estimates could be change depend at many factors. This investment idea is for information purpose only; you can change actual value from approximate values to find actual investment you require to start. Investment at purchase of medicines also varies according to stock you purchase in starting and cost of medicines you purchase. Most of retailer can get medicines at credit from wholesaler and distributor. Inspection is carried out by Senior Drug Inspector/Drug Inspector or any other person appointed by state government time to time for inspecting pharmacies and chemist shops. If all facilities, documents, competent person detail and other particulars are found to be satisfactory then application file ahs to be processed for issuing retail drug license. Otherwise authority can return file for amendments and/or rejection. Profit margin of chemist shop varies products to products but generally 16-20% margin is provided to retailers by most of companies with scheme. At generic medicines, this margin increases to higher side. Along with allopathic medicines, A Pharmacy and Chemist Shop also deal in Ayurvedic Medicines and Food/Dietary Supplements. If pharmacy and chemist shop want to sell food and dietary supplements along with medicines and drug. Then it must be registered itself under FSSAI. Read in detail about how to apply for FSSAI Registration? Shop registration requirements and criteria may vary according to your area. Before starting pharmacy business, it should be recommended to confirm first for shop registration or any other registration in locality. Drugstore word is used for such licensees who do not require the services of a qualified person. Chemists and Druggists word is used by such licensees who employ the services of a Registered Pharmacist but who do not maintain a “Pharmacy” for compounding against prescriptions. I am planning to open a pharmacy /medical store in a small village of gorakhpur, Uttar pradesh. I am planning to have a doctor in that pharmacy which can recommend medicine. I am looking for a catchy name for my pharmacy / medical store according to locality which helps as booster for my pharmacy. You can read how to select catchy name for your company? same will be applicable for your shop. it is a nice article. 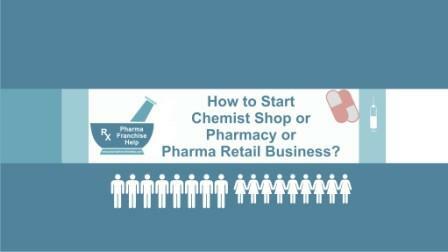 Actually, after reading this blog everyone has gotten a little bit idea about the how to start the chemist shop. What document required to start a medical shop. This Detailed is very useful to each person who can start his chemist shop. Thanks for the published this important information for us.